It's rare that I read a review that very much makes me more (or less) inclined to read a book than I would have been just from knowing the book's title and genre, the author's qualifications, and its subject. But this sounds like a really good book. How we get from here to there: France is toying with Step 3 now. (1) We want to spend more than we have. (2) People who will get the goodies can outvote those who will pay for them. (3) People who will pay for them start thinking about leaving. (4) Build fences at the border, and make the gun turrets point in. Terrific, if horrifying, analysis from Megan McArdle of how tax policy bankrupted a lot of pensions. We just love using tax deductions to guide public policy. Unfortunately, it always leads to making economic decisions on the basis of tax treatment rather than on the basis of rational economics. Then the IRS has to step in and try to substitute its rules and judgment for the rational economics. How many time does it have to fail? If taxes were low enough, it wouldn't be necessary to have so many deductions for things like healthcare and retirement expenses, and there's never any need for the government to micromanage how people provide those things for themselves, either. More sequester fun: the BLM cancels auctions of more than 3,000 acres of oil & gas leases on public land. As the Wall Street Journal noted, that makes as much sense as unmanning toll booths and forgoing the income from drivers, citing budget cuts. MacDonald's can save money by not selling hamburgers! But, as the WSJ also notes, it makes perfect sense if the idea is to exert maximum pain, so as to build political pressure to stop the sequester, and to cripple the O&G industry in service of environmental orthodoxy as a bonus. Meanwhile, President Obama advises us not to be cynical about government. I'm not cynical about government. I think government is the crowning glory of our social species, used for its right purposes. I am cynical about our president. Apparently the French have picked up on Hank Williams III, without quite getting the culture that underlies the music. H/t: Our brothers of the BSBFBs. On the plus side, the New York Times is actually covering this story. On the other hand, is anybody really buying this explanation? The IRS issues an apology. Come off it. The "but..." gives it away. None of us are shocked by this. This is exactly what we expect from our government. That's why the President made his famous joke about it. It's funny because it's true, right? We all always knew it was true. In an essay called "How Government Wrecked the Gas Can," writer Jeffrey Tucker describes the frustration of just trying to pour gasoline into a car. It's hard to do, not because we don't understand how to do it better, but because we aren't allowed to: gas cans are no longer permitted to have vents. Let's talk not just about the gas can, but about the gasoline itself. The ability to store energy is at the basis of all our advances in civilization. The ability to produce more food than we could use and store it up was one of the things that enabled cities, with all the advances of philosophy and its products, mathematics and the early sciences. The ability to bring the energy stored in a rushing river to work brought us the mills that were such an amazing technical advance at their time. The ability to bring the energy stored in wood and coal to work in the steam engine enabled us to cross mountains and vast distances at speeds as fast as a horse could run, and faster, without tiring. And the internal combustion engine, and the gasoline that powers it, enabled us to fly. More than that, it enabled us to be free in the literal sense. We could go where we wanted to go. We could do many things, as individuals, that we could not have done by ourselves before. With a chainsaw I can, by myself, fell a great oak and buck it into logs in part of an afternoon. There's enough stored energy in that tree to heat my home for a good part of a winter, but the only reason I can access it is the stored energy in the gasoline. The ability to bring that to bear on the work I need to do is what enables me to live as a free individual, outside of a city and in no larger a community than I want. It used to be that gasoline was a kind of energy you could store. When I was a boy, we would have a gas can -- with a vent -- that had a few gallons inside of it in case we needed it around the place. It might be used for a lawnmower, or the tiller for our garden that excused us from owning a mule, or to mix up with fuel oil for a chainsaw. These days you can't store gasoline for very long. Even with fuel stabilizers, the stuff will go start to go bad after about thirty days. It's not that we don't know how to make it better, so that we could store it up and use it when we liked. It's that we aren't allowed to do it. The new stuff rots, partially turns into varnish. It'll burn so hot it will score your pistons, destroying the engine it was supposed to serve. Why? Because we said so. 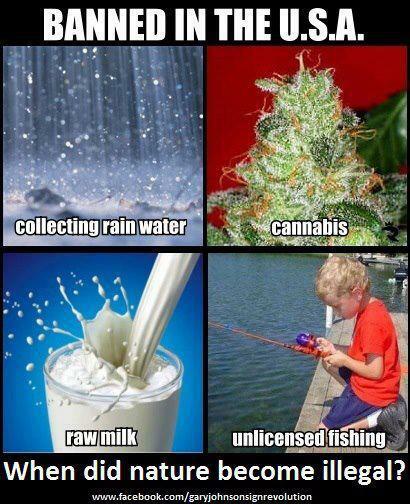 Ought nature to be illegal? 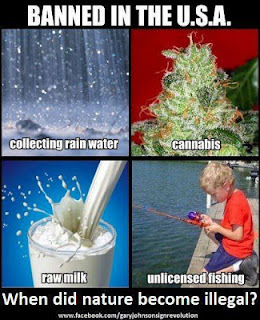 It might be a reasonable argument against the illegal status of cannabis, as opposed to (say) manufactured drugs such as methamphetamine or cocaine. On the other hand cyanide is all natural, and it's still good policy to at least advise people about the effects of its consumption. Still, perhaps there ought to be a presumption of legality in the natural. Else we depend on masters, where once we could grow our own food. House Bill 1076 by state Representative Steve Toth (R-The Woodlands) would prohibit any state agency or agency employee from enforcing a federal statute or regulation on firearms or firearm accessories that does not exist under Texas state law. Any agency that violated this prohibition would not be allowed to receive state grant funds for the fiscal year in which a violation occurred. This is only one of a raft of bills* that recently passed significant legislative hurdles in the same week when the NRA held a big rally in Houston, including proposals to eliminate criminal penalties for inadvertent display of a concealed weapon, to streamline the CHL license procedure, to penalize state agencies that post erroneous notices prohibiting the carrying of weapons, to limit the ability of private college campuses to restrict the transport of licensed firearms in students' cars, and to allow police to auction seized firearms rather than destroy them, if they can't be returned to their rightful owners. It's nice to get cheerful political news now and then. If you'll excuse me, I've got to go pop some corn in preparation for the kick-off of the Benghazi hearings. To my amazement, the subject is finally getting coverage on CBS, PBS, and CNN. Even more shocking: on NBC and in the Washington Post. The NewYork Times has gone so far as to publish comments from its Public Editor about whether the New York Times should be covering the story. Much of the coverage naturally focuses on attempts by unscrupulous Republicans to politicize a story about the Obama administration's presidential campaign strategy to leave Americans to die without help overseas and then lie about it. *I got the House bill information from an NRA email update, but the website is here. So our credibility is undiminished. I'm glad he cleared that up. I had been worrying that he might have been indulging himself in a little preening trash-talk that he didn't expect to be taken seriously. Apparently some of our own fellow citizens are not as taken with the NRA. I have seen the light. After all these years, I now agree that it’s fruitless to give the benefit of the doubt to people who are so obviously corrupt, so clearly malevolent, so bent on hurting innocent people for their own sick gain. No more due process in the clear-cut case of insidious terrorism. When the facts are so clearly before all Americans, for the whole world to see, why bother with this country’s odious and cumbersome system of justice? Send the guilty monsters directly to Guantanamo Bay for all eternity and let them rot in their own mental squalor. No, no, no. Not the wannabe sick kid who blew up the Boston marathon or the freak that’s mailing ricin-laced letters to the president. I’m talking about the real terrorist threat here in America: the National Rifle Association. I’m not laughing. What the NRA did last week was no laughing matter. Are we sure Guantanamo Bay will hold another five million prisoners? On the upside, it's better than the proposal to kill NRA members we heard earlier. At least this one does something to provide jobs! Our liberal friends have finally found an idea capable of achieving full employment: guards to watch over a vast number of political prisoners. For a long time we've heard it said that the Tory party in the UK is just the Labor party in slow motion. That is, there's been a consensus about how to govern: taxes go up, freedom goes down, government grows, union with Europe proceeds. All you get to vote for is whether it happens more or less quickly. Sounds like that consensus may be breaking up a bit.